If your router is more than 4 years old, it may no longer be performing optimally and could be slowing down your internet. You can test this by unplugging the Ethernet cable from the back of the Wifi router and plugging it directly into your computer – if your internet speed significantly increases, then the Wifi router is the problem. If your Wifi router is located at the other end of the house, its signal may not be strong enough. You may need to upgrade your router, or run a cable into a more central location. Place your Wifi router as high as possible in the room for the best result. Many printers now have wireless capability, but if they are not set up correctly they can interfere with your in-house Wifi and slow down your speed. If you’re not sure, get your preferred IT specialist to check them for you. Don’t turn off your rooftop unit! We are constantly monitoring the connections on our network, making upgrades and improvements. Our rooftop units don’t use much power, so if you want the best from our service we recommend that you don’t turn the power to the roof off at night or if you’re out during the day. If you notice your internet speed has dropped after a power cut, contact our office, as occasionally power surges can affect our equipment. 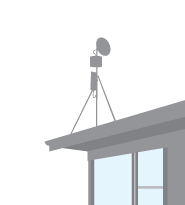 Lightning strikes can also damage equipment and very high winds can move rooftop antennas, so contact us if you think your connection has been affected by adverse weather.